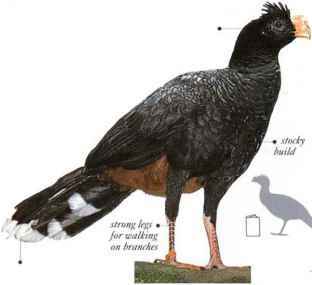 A forest species resembling a gamebird, the Common Piping-Guan has a slender huild, long legs, and strong feet, all of which arc-adaptations for walking along tree branches. It lives mostly in the upper and middle levels of the forest, where it walks, jumps, and Hies among branches. Its diet consists mainly of fruit, with some-buds, leaves, and occasional small animals, Birds usually occur in groups and often perch in open view on a high branch. As the name indicates, they utter high pitched, whistling calls. Breeding birds perform a display flight from tree-top to treetop, in which the flight feathers make a loud, whirring sound. • NEST A scanty twig nest, placed high in the canopy. South America, in the Amazon and Orinoco river basins. I his stoutly built bird is capable of moving among the branches of trees, but it spends most of its time foraging on the forest floor. It takes to the trees if disturbed or alarmed and also roosts there. The short, curved-tipped bill is extended upward to form a prominent, thin ridge with flattened sides, forming the "razor" edge from which the name is derived. This feature seems to serve purely as a decoration. The species feeds mainly on fallen fruit, also taking buds, leaves, seeds, and occasional insects. • NEST a saucer-shaped nest of leaves and stems, in foliage at low or medium height. • DISTRIBUTION Amazon basin in C. Brazil. E. Peru, and n. Bolivia. The _ small population recorded in K.Brazil may be extinct.